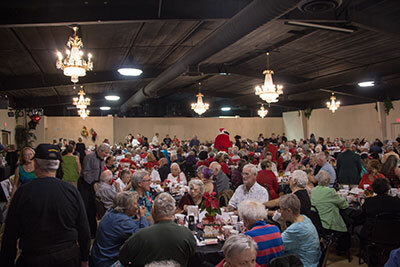 An estimated 650 seniors and homeless veterans turned out for the annual senior Christmas dinner. 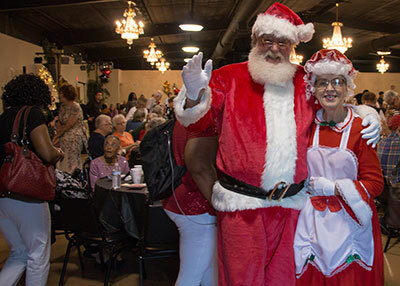 The event, which has been organized by Barbara Jones of the HCSO for 19 years, is filled with smiles, laughter, conversation and tears, and is the only Christmas some seniors wil have. Michelle Traphagen photos. HCSO Riverview Community Service Officer Barbara Jones with Chaplain Rev. R. Davis of the Tampa Police Department and HCSO Chaplain John Garbreana. 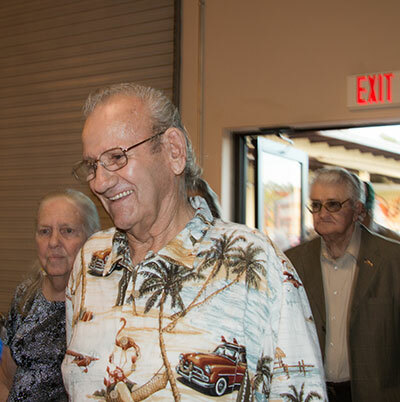 Seniors from nursing homes and memory care units through South Hillsborough were invited to the event. Jones greets a woman from a memory care unit. 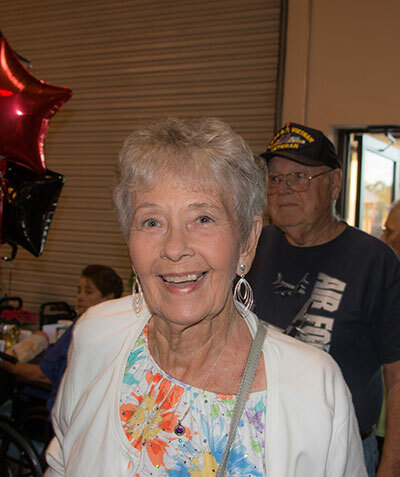 It was a “Night at the Oscars” for the roughly 650 seniors at the annual holiday Christmas dinner at the Showmen’s Club on Thursday. 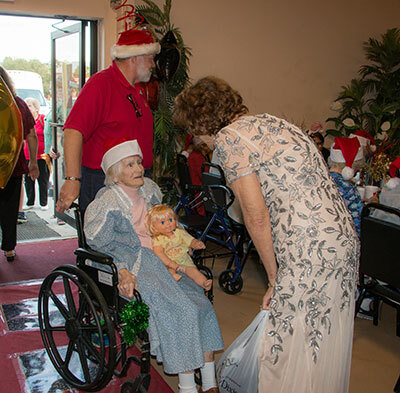 The event is held for seniors and homeless veterans who may otherwise be alone during the holidays. 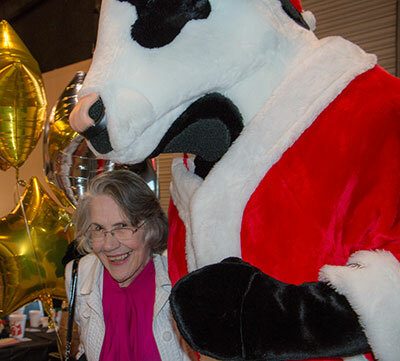 For many seniors in attendance, the full dinner with gifts and camaraderie is Christmas. 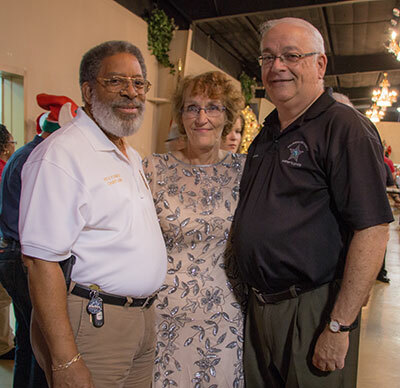 Hillsborough County Sheriff’s Office Riverview Community Service Officer Barbara Jones organized the event, a nearly year-long effort; this was her 19th year. Jones picked up the event from Chaplain Rev. R. Davis of the Tampa Police Department, who ran the event in the 1980s. 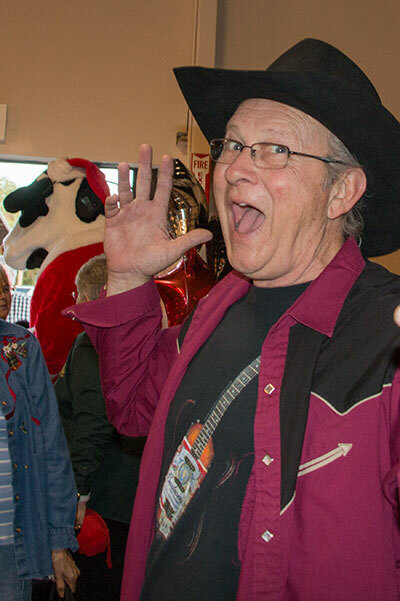 The dinner is made possible through generous donations from area businesses and through countless volunteers. “Moving” is a word that is used often to describe the event, as with the smiles the emotions come through, often in tears of happiness. Over the years, even long after the dinner, Jones hears words of sincere gratitude from those who attended. After 19 years, many thousands of people have enjoyed the meaning of the spirit of Christmas. 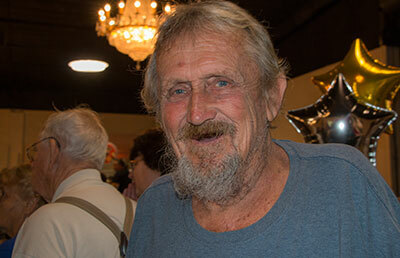 Jones also shared some news with the seniors and volunteers at the dinner. Pick up next week’s Observer News to find out more.